Tumbler – 24 oz. Keep your favorite hot or cold drink in this large size, double wall, quality Tumbler. The double wall construction keeps the outside of the Tumbler at room temperature and prevents “cold drink sweating” on the outside. The Navy Blue lid features snap off construction with a sliding drink spout and a straw cutout. 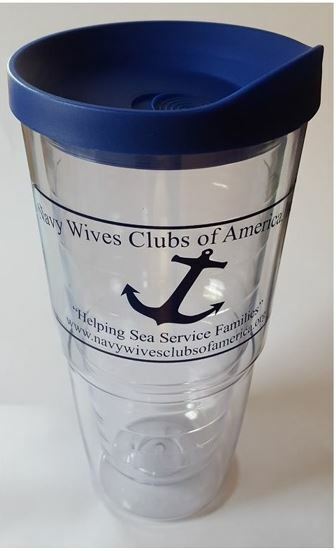 The Navy Blue artwork features our Organization name, NWCA Anchor, web address and a Message of Encouragement to our “Sea Service Families.” The Tumblers, tapered design allows it to fit into most auto cup holders. Dimensions: 8” H x 4” W at the top x 2 ½ W “ at the bottom. Cost: $12.00.